We are considering that when Auto Invoice Created from Sales order with discount and discount amount hit in charge account other than revenue. So when we need to generate Credit Memo against sales Order or Auto Invoice so discount portion should hit in the same account as it was hit at the time of auto invoice. For Auto Invoice please refer the Other Post. For modifier please refer the post. 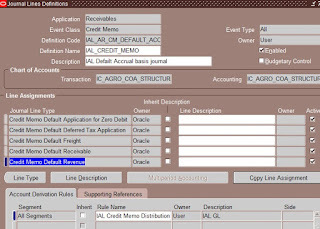 Step2: Create JLD(Journal Line Definition) by coping from ORACLE to User with Event Class:Credit Memo and Event Type: All. 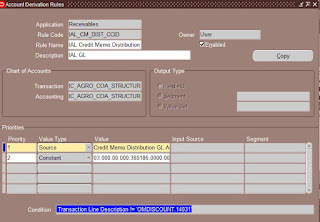 Scroll down to Credit Memo Default Revenue under section Line Assignment. Select the user ADR from LOV which one created in Step1. Step3: Create AAD (Application Accounting Definition) if not created earlier by coping from ORACLE to User with definition code:AR_DEFAULT_ACCRUAL. 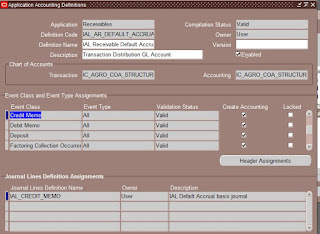 Select the Credit Memo by scrolling under section Event class and event type assignment. Go to JLD assignment section insert a new line with JLD created in Step2. Delete the seeded one where owner is oracle. 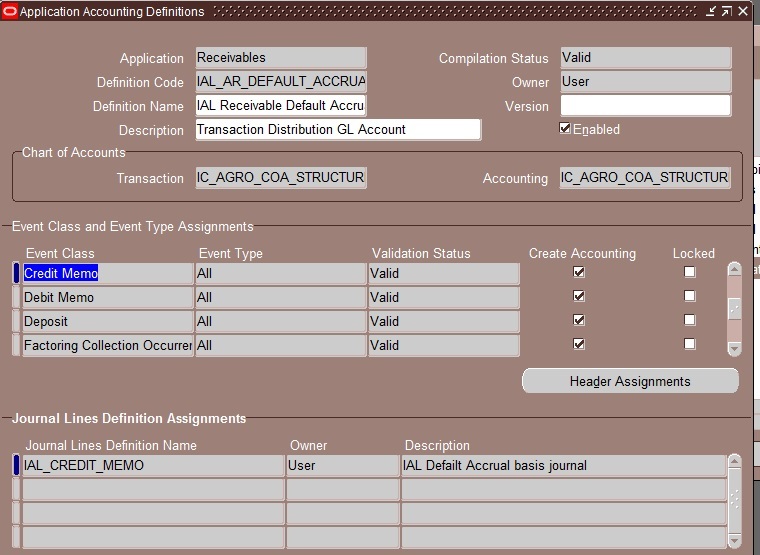 Step4: Now create a sale return and run auto invoice for credit memo, once the credit memo is created in AR, run the create accounting in draft mode and check accounting.